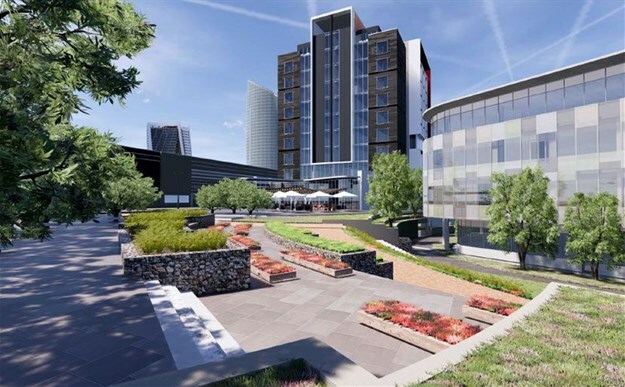 The City Lodge Hotel Group has announced that an exciting "new concept" hotel within its Courtyard Hotel brand will be developed in Waterfall City north of Johannesburg. Construction of the 168-room hotel, which is a land and building lease agreement with JSE-listed property company Attacq and the Barrow Group, is expected to begin in March this year with completion expected in October 2020. The hotel will feature 10 levels and will include a rooftop bar/function area as well as a 100-seater conference facility. It will have 160 rooms as well as eight suites, meeting rooms, a swimming pool and a gym. The City Lodge Hotel group already has a 149-room City Lodge Hotel within the Waterfall City mixed use residential, office and commercial area which has established a strong market niche for both business and leisure travellers. Waterfall City is located in a rapidly growing node between Johannesburg and Midrand and includes the Mall of Africa shopping and entertainment complex. "With the Waterfall City node growing strongly, we are extremely excited about the prospects for this Courtyard Hotel which will showcase a new concept which our research has shown will be popular with our core market,” CEO Andrew Widegger said. Courtyard Hotel Waterfall City will be the sixth Courtyard Hotel within the group, complementing one each in Pretoria and Port Elizabeth and three in Johannesburg. The group is expected to open its 154-room Town Lodge Umhlanga Ridge in July and is planning to develop a 90-room Road Lodge in Polokwane. It also expects to open the 148-room City Lodge Hotel Maputo in April. Once these new hotels are operational, the group will have 64 hotels in six countries in East and Southern Africa offering 8,160 rooms to business and leisure travellers.